At the moment it began, a Labour MP called Peter Kyle had been muttering something about the customs union. Or was it the single market? It might have been the backstop. Who even cares any more? Nothing of any interest whatsoever has been uttered in that chamber for at least two years. There is nothing left unsaid, no angle unworked, no debating point that has not been sanded away to nothing by Brexit's dreary tides. There was a gentle commotion, eventually. Members did their best to carry on as normal. Mike Gapes interrupted to make a point of order. Something to do with the 2016 referendum being advisory, I think. If it wasn't that, it can only have been another one of the approximately nine salient points about Brexit that have been repeated, ad infinitum, for three long dismal years. They were a work of art, up there, the Flat Arse society. This was humanity, turning its soft, inscrutable face towards its torturer, begging to be noticed, begging to be saved. Quite literally, in fact. The protest had nothing at all to do with Brexit. The people were from Extinction Rebellion, a climate change direct action group. Even the police could scarcely be bothered to puncture the slow spell of the moment. By the House of Commons clock, it was eight minutes before even the first arse was peeled away. A policeman appeared to be going at one with a small spray. In a later statement, we learned that a number of the 11 had come with superglue, and had actually adhered themselves aggressively to the glass, their liberation requiring the application of a special solvent that the authorities, miraculously, had to hand. Occasionally, in free societies and through institutions of this nature, the people must be forced to be free, once wrote Jean-Jacques Rousseau, though it is questionable whether this is quite what he had in mind. 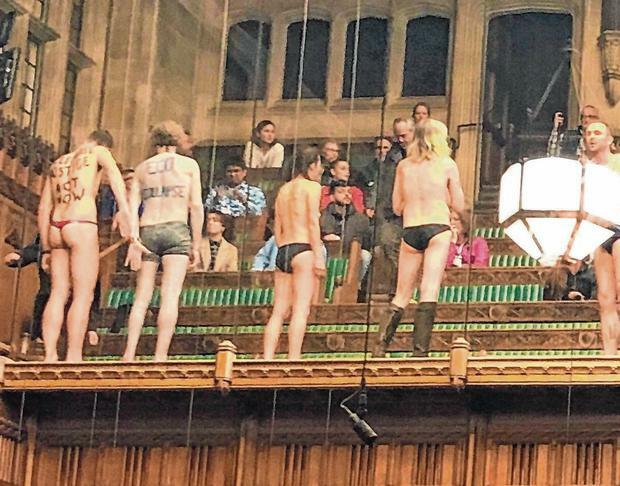 Hours after the protesters had been sent on their polite, denuded way, an MP called Ed Vaizey was going through the dreadful motions of the legitimacy of a no-deal Brexit as conferred by the people through the 2016 referendum, and more police arrived in the public gallery again. They were, I have been told, gathering "evidence" - recording, for posterity, the vaporous shapes of the buttock marks against the window. At half past 10, history, if it can be bothered, will record that the House of Commons voted, yet again, to reject every single version of Brexit that was put before it. No to the customs union, no to "Common Market 2.0" (whatever that is), no to a second referendum, no to revoking Article 50, no to the past, no to the present, no to the future.